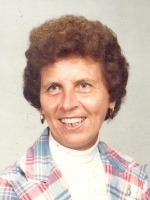 ALBANY – Virginia G. Daley went home to be with the Lord on July 21, 2013 at the Teresian House. Born in Albany on April 7, 1926 to John and Mary Burns, she graduated from St. Ann’s High School. She met her husband Daniel in 1949 while working at Sterling Winthrop. Virginia was predeceased by her husband after 49 years of marriage. She was a devoted mother to Virginia, Edward and Eileen Daley; beloved grandmother to Daniel Daley (Cristy) and Matthew Daley and recently became great grandmother to Emma Daley. She is also survived by her siblings Jean Albert Burns, C.S.J., Geraldine Lemley, Danny Burns, Rosemary Reddick and Agnes Conroy; her brother in law Richard Daley (Joyce) and by many nieces and nephews. She was predeceased by her siblings John, James, Edward, Donald, Joseph, Gerald, and Bobby Burns, and Helen Singer and Mary Ballato. The family wishes to acknowledge with deep gratitude the devotion, compassion and loving care Virginia received while at Teresian House, especially by the staff of 4-B. In lieu of flowers, please consider a donation to the Teresian House Foundation or a charity of your choice. A Mass of Christian Burial will be celebrated by Most Reverend Howard J. Hubbard on Saturday at 11:00 am at Teresian House’s Infant of Prague Chapel, 200 Washington Avenue Ext., Albany. A calling hour will be held from 10:00 to 11:00 am at the Teresian House. Interment will be in St. Agnes Cemetery. To leave a message of condolence for the family or send a sympathy card please visit www.HansFuneralHome.com. Click here for directions to the Teresian House. Click here to view Virginia’s resting place in St. Agnes Cemetery, Menands, NY. Ginny, My sincere sympathies to you and your family. May happy memories sustain you. We were saddened to hear of your loss. Our thoughts and prayers are with you. So sorry for your loss. She is free from pain and able to fly now! Ginny, Eileen and Eddy, I am so sorry for your loss. I know your Mom has not been well for a long time but that certainly doesn’t make it any easier. She was a wonderful person and I have many fond memories of her and also your Dad. I always remember Aunt Virgie’s wonderful laugh and her beautiful smile. It is so hard to lose your Mom, because there’s no other love that is quite the same as a mother’s love for her children. I’m so sorry for your loss. May you find refuge in God’s Word, for he promises that the “day is coming when all those in the memorial tombs will here Jesus voice and come out to a resurrection of life”..(John 5:28,29) Then , “the righteous themselves will inherit the earth and live forever upon it”. (Psalm 37:29) May the hope of embracing your dear loved one again, help you get through is difficult time.